Freedom Motors, one of the leading US manufacturers of wheelchair accessible vehicles, is proud to announce the arrival of their new truck and full-size SUV line; available now. Mobility customers in wheelchairs and their families now have expanded options with these full-sized trucks and SUVs to explore new roads, haul payloads and even tow a boat leading to more independent lives. Customization options include 4WD or 2WD and driver or passenger side entry conversions. Every truck and SUV comes equipped with Freedom Motors' state-of-the-art hydraulic lift system which is extremely reliable and built to work in the most harsh conditions. "As with every Freedom Motors product, we want to offer the most innovative wheelchair accessible vehicles available on the market today," says Freedom Motors USA President, Sieto van Dillen. "We've not only given this new truck and SUV line improved rugged durability, we've also shortened the time it takes to enter or exit the vehicle by reducing the time to deploy the lift system to less than 15 seconds - all in less space needed when compared to most accessible minivans!" These new wheelchair accessible vehicles offer best-in-class features such as taking the whole family for a spin with a 5 passenger truck capacity, or up to 7 passenger SUV capacity with enough cabin room for everyone to feel comfortable. With the 750 lb lift capacity, everyone will feel safe and secure. Every full-sized truck and SUV has the option to install a towing package and with superior ground clearance and tough 4WD, the outdoors has never been more accessible. Weather is no problem with the new industrial grade hydraulic system that is specially designed to withstand extreme temperatures, and is built to last with an industrial grade stainless steel floor and side skirt. 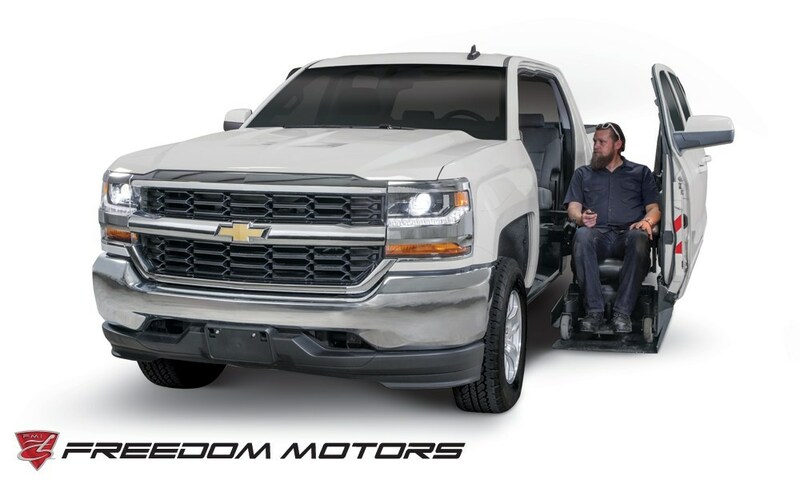 Freedom Motors USA is now accepting orders on select models for the wheelchair accessible Chevrolet Silverado, Chevrolet Suburban, Cadillac Escalade, and GMC Sierra.